My relationship with JR started with a simple phone call after spotting his “Mission Creek Log Homes” ad in a local publication. 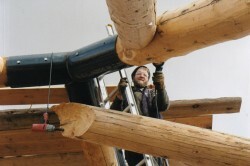 He was the first log builder I contacted, and ultimately the only builder I contacted. Initially I called JR to get some basic information a first-time log home builder requires as they are pondering a future build. At the time of that phone call, I didn’t know if I would be looking to build in one year or ten years. Even knowing that, JR kept in contact with me over the next two years until I was ready to move forward with the project. His dedication, thoroughness, honest demeanor and professionalism made my decision easy once it was time to build. The day of construction was nothing less than impressive. JR and his crew worked solid for 7 straight hours, taking no breaks, as an impending snow storm approached. His entire crew exemplified hard work and professionalism and left a beautiful structure in place. 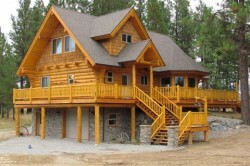 I still call JR from time to time when I have questions regarding various log-home specific projects. However, I no longer consider him my builder, I consider him my friend. I say with absolute confidence that you will not regret your decision to work with JR and his crew at Mission Creek Log Homes.